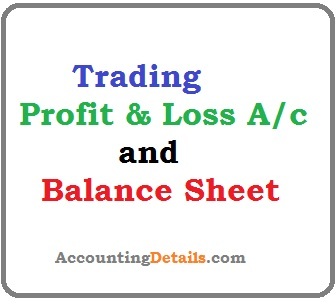 Trading account format and accounting trading and profit and loss account examples in balance sheet. Different solved problems in trading profit and loss a/c in final accounts format for carriage outwards. Prepare trading and profit and loss account and balance sheet. From the following balances extracted from the books of X & Co., prepare a trading and profit and loss account and balance sheet on 31st December, 1991. The stock on 21st December, 1991 was valued at $25,000. The following trial balance was taken from the books of Habib-ur-Rehman on December 31, 19 …. Required: Prepare income statement/trading and profit and loss account and balance sheet from the above trial balance in report form. For the year ended December 31, 19…..
As at December 31, 19…..
i sarcascally need help on this accounting process this is my courses of studies?